2009 was riddled with stories of corporate downsizing, bankruptcies, and economic uncertainty. The environment rattled even the most accomplished businesses. Some failed, closing the doors forever. Others narrowly survived and new businesses are emerging, both facing the incredible challenge of adapting to a new business climate. Junction Creative Solutions (Junction), an Atlanta-based consulting firm, specializes in developing and executing strategic solutions across business, brand, marketing and technology to embrace new opportunities for the creation of more sustainable businesses. Junction considers 2010 as the year for a strategic uprising. For the last decade, many businesses operated without detailed business plans and strategic executions. Consumers were spending more as revenues increased. When the pendulum suddenly shifted, companies weren’t prepared to handle the drastic decline in consumer spending and the effect it had on revenue. For those businesses who survived, strategy is becoming the priority. A strategic plan is more than a roadmap. It defines goals, objectives, and key milestones with considerations for resources and financial capability. Companies can identify and create efficiencies in processes, ultimately maximizing return on investment. Call Nestle Hotline at 1-800-295-0051. When asked if you want to continue in English or Spanish, wait QUIETLY for about 10 seconds and I PROMISE you will smile. Keep going and press 4. Then any option after. Don’t ruin the surprise for the next person. Thanks Nestle for shaking things up! There was a leap in the pace of launching new technology companies in the second quarter of 2009, CONNECT’s newly released Second Quarter 2009 Innovation Report shows. Start-ups were up 53% with 102 companies launched. In the first quarter of 2009 only 66 compa- nies were created. The increase over second quarter last year was 34% with 76 companies launched in the second quarter of 2008. 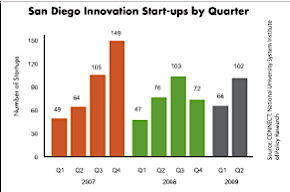 Overall, San Diego accounted for 14% of new technology businesses started in California, in the second quarter of 2009, ranking third after Los Angeles (LA) and Santa Clara counties. LA had 140 start-ups and Santa Clara had 117. Linda Richardson, author of Sales Coaching: Making the Leap from Sales Manager to Sales Coach, wrote an interesting perspective on zones that proves relevance to employees across an enterprise….The value in understanding the cultural zone of your employees yields increased employee retention which directly correlates to a more profitable company. Let’s dig deeper. Most employees work and live in predominantly one zone, although it’s possible to switch from zone to zone for a short time. Effective managers can read these zones and manage employees into a stretch zone, resulting in increased productivity, consistent growth, and greater employee retention. When a company isn’t constantly managing employee turnover, the focus becomes profitability and growth. How is your company reading and managing the zone? Developing a strategy, whether enterprise wide or at the functional level, is a daunting task for any company. Here’s a high-level check list to get start the conversation. What is the overarching strategy and tactics for executing this vision? What resources are required to execute on the strategy? Who is responsible for each tactical element of the strategy? List potential risk factors. How can the strategy be adapted in response to those risk factors?